Description: This sea anemone is colonial, forming encrustations of variable thickness and shape. 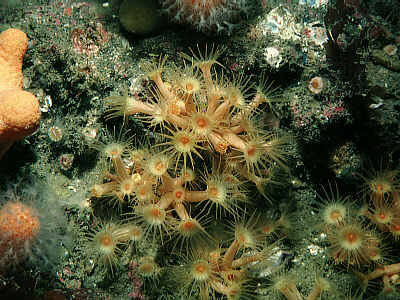 Each polyp has a serrated parapet and pointed tentacles of moderate length; the wall and base may be encrusted with sand. 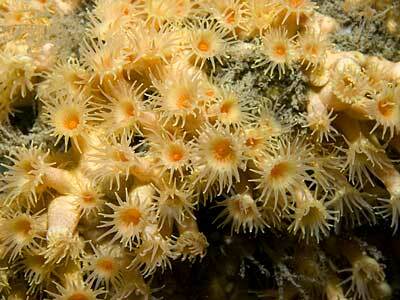 There are up to 34 tentacles, polyps are up to 20mm tall. The colour is usually yellow, often orange around mouth. Habitat: Found in open coast rocky habitats attached to rocks and sponges, often on vertical faces or beneath overhangs, from 6-100m depth. Distribution: Southern and western coasts of the British Isles, south to the Mediterranean and north to Rathlin Island, Northern Ireland, with one Scottish record. Similar Species: Parazoanthus axinellae and Parazoanthus anguicomus are distinguishable by tentacle numbers, size and colour. Parazoanthus axinellae forms discrete clumps while Parazoanthus anguicomus tends to form more extensive sheets. Larger and different in colour from Isozoanthus sulcatus and Epizoanthus couchii. Numerous individuals arising in clumps from thin or thick basal encrustations. Picton, B.E. & Morrow, C.C. (2016). Parazoanthus axinellae (Schmidt, 1862). [In] Encyclopedia of Marine Life of Britain and Ireland.